Hi, finally xiaomi launched MIUI 8.1.1.0 Global stable Rom. this is a MIUI 8.1.1.0 Global stable Rom for Xiaomi Redmi 3s Prime and here is an easy and safe tutorial for install Xiaomi Redmi 3s Prime MIUI 8.1.1.0 Global stable Rom. Xiaomi Redmi 3s Prime has Qualcomm MSM8937 Snapdragon 430 Octa-core 1.4 GHz processor along with 3 GB RAM and 32 GB ROM. This phone has 5.0 inches IPS LCD capacitive touch screen size with 720 x 1280 pixels. Xiaomi Redmi 3s Prime has 13 mega pixels rear camera with LED flash and 5 mega pixels front camera in Xiaomi Redmi 3s Prime. This is a MIUI 8.1.1.0 Global stable Rom. 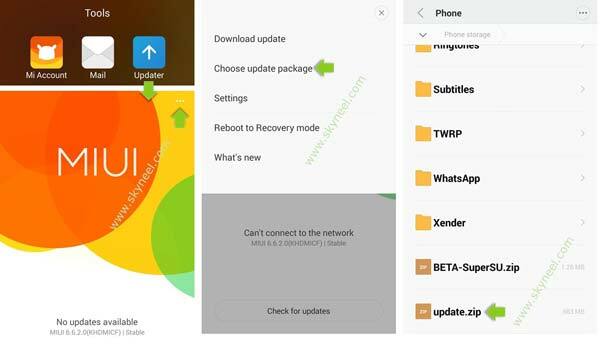 This is an Android 6.0 marshmallow based MIUI update. New added Set your Lock screen wallpaper as the conversation background. Optimization Opening contacts in Messaging . New added Added permissions for Lock screen and background notifications. New added Long press the numbers to convert them to the Chinese financial characters . New App Swipe to the edge of the screen to hide Quick ball . Step 1: Download miui HM3s Prime Global Stable V8.1.1.0.MALMIDI file and rename this zip file as “update.zip” like miui_HM3s PrimeGlobal_V8.1.1.0.MALMIDI_874f56cdc1_6.0.zip. Step 4: Now your phone is going to Reboot in recovery mode and Rom flashing process start. Don’t interrupt this process, it might to take 4-6 minutes for your phone to first boot on MIUI 8.1.1.0 Global stable Rom. After install Xiaomi Redmi 3s Prime MIUI 8.1.1.0 Global stable Rom, you can root your phone because root allows you to use a maximum of your phone without any restrictions. After root you will install custom apps, Rom and custom setting in your phone. But first read Root Advantage and Disadvantage by this article. I hope you like this New update Xiaomi Redmi 3s Prime MIUI 8.1.1.0 Global stable Rom installation guide from which you will be able to easily install Xiaomi Redmi 3s Prime MIUI 8.1.1.0 Global stable Rom without any extra efforts. If feel any problem in this guide then please use comment box. Thanks to all.